Chickenpox Outbreak Brings Fear And Discomfort To Bangladesh's Rohingya Camps : Goats and Soda At the largest refugee camp in the world, Rohingya refugees and aid agencies face numerous challenges. Now they're also dealing with an outbreak of chickenpox. 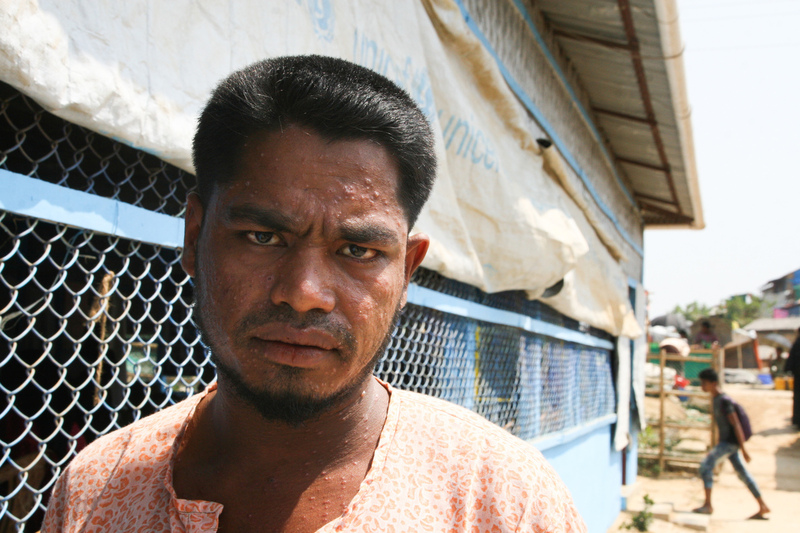 Sodul Amin, 30, is one of tens of thousands of Rohingya refugees who've gotten chickenpox since December. The highly contagious disease spreads easily in the overcrowded refugee camps. Yassin is wailing. He's running a fever and there are small red dots all over his body. Katu is terrified. "I'm scared because my baby is very young so he is not able to tolerate the pain," Katu says. Yassin's older sister also got sick. Katu had no idea what this disease was or how bad it might get. Late in 2017, Katu and her family fled from Myanmar to Bangladesh to escape attacks by pro-government militias. They've ended up in the camps outside Cox's Bazar, Bangladesh with nearly 700,000 other refugees. Dr. Mohammad Ahsanul Kabir, who runs the clinic, diagnoses Yassin's condition even before he gets within arms-length of the child. "Chickenpox," the doctor declares cheerfully. Katu is not chipper like the doctor. She says she's never heard of chickenpox before. She's suspicious of this illness. And she even goes as far as to say that there's no disease like this back in Myanmar. Kabir has seen lots of chickenpox over the last couple of months. He first started seeing patients with the disease in December. In late February, he says, he was getting 30 to 35 cases a day just in his small, single-doctor clinic. By the end of March, there were nearly 65,000 reported throughout the sprawling Rohingya refugee camps. Chickenpox is highly contagious. The virus can move among family members as people touch each other or share blankets or even touch the same table. It also can spread directly through the air. "They didn't get any vaccines," he says. "Before coming here they don't have any idea about vaccines." And not just the chickenpox vaccine. Kabir says the Rohingya weren't getting the basic childhood immunizations that the World Health Organization has been recommending since the 1970s: vaccines for easily preventable diseases like diphtheria, measles, polio, tetanus and whooping cough. "These people were not treated well," he says. "The Myanmar military regime are not at all bothered with [providing health care for] these people." 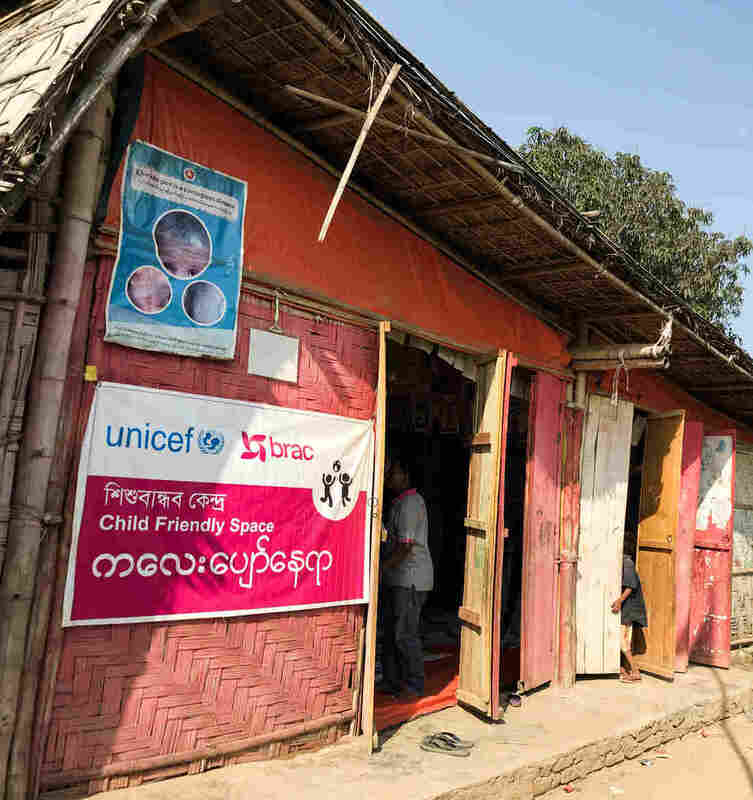 Soon after the Rohingya arrived in Bangladesh, UNICEF and other health agencies launched massive vaccination campaigns to try to get kids immunized against the most serious and potentially fatal illnesses like diphtheria and measles. More than a million doses of pentavalent vaccine to protect against diphtheria, tetanus, whooping cough, hepatitis B and a bacterial infection known as Hib have been administered in multiple rounds in the camps. Despite this, there were 23 suspected cases of diphtheria in the camps in February alone. Chickenpox, while uncomfortable, hasn't been a priority for vaccination. But the flare up of cases in the last few months does illustrate how the conditions in the camps are ripe for the spread of a highly contagious viral disease. There's no specific treatment for chickenpox. Kabir can help ease a patient's fever, encourage the kids not to scratch. Drink lots of fluids, he tells them, and the disease will usually clear up in a week or so. From a medical perspective, the cases are pretty easy for him. What's difficult is the terrified parents and having to calm their fears that this horrible rash could be fatal. "Chickenpox is not at all fatal. Not at all fatal. No, no, no," he says, practically shouting this as if the volume may finally help get the point across. "There is no death or anything." "They're afraid sometimes, very much afraid," he says of stressed-out moms like Katu. Medically, the real problem with chickenpox, he says, is when it strikes adults. In kids the illness tends to clear up after a week or ten days. In adults it can last for up to a month and the symptoms can be more severe. For an example, Kabir only has to look across his waiting room. Thirty-year-old Sodul Amin is also waiting to be seen at the clinic. After both of his kids had chickenpox, he's now come down with it. "At first my whole body ached and I felt dizzy," Amin says. "Then I got a high fever and rashes started to come out on my skin." The rash has covered his entire face. Kabir says the pustules around the eyes and mouth are particularly painful and prone to infection. The refugees often bathe outside at open water pumps. And keeping these sores clean can be a struggle. Overall sanitary conditions in the camps however, are better than they were when the Rohingya first arrived in 2017. A chickenpox outbreak in the early days of the influx would have been a disaster. The camps were inundated with mud and finding clean water was almost impossible. Refugees now have more access to well water and pit latrines. But so long as thousands of people are packed so closely together at the camps, health officials say disease outbreaks are going to be a challenge. And while a mass vaccination campaign against chickenpox isn't yet in the cards, the Bangladesh Ministry of Health, along with international aid groups, have launched vaccination drives to try to get Rohingya kids immunized against a half dozen other vaccine-preventable diseases. They hope to get the Rohingya caught up on immunizations that the World Health Organization has been demanding for all kids since the 1970s.